The dalit upsurge has rattled the BJP, but, can it halt the hindutva bandwagon? April started on a cruel note. Nine people were killed and scores injured, most of them in states ruled by the BJP, as angry dalits protested the March 20 judgment by the Supreme Court banning immediate arrest of persons charged under provisions of the Scheduled Castes and Scheduled Tribes (Prevention of Atrocities) Act. 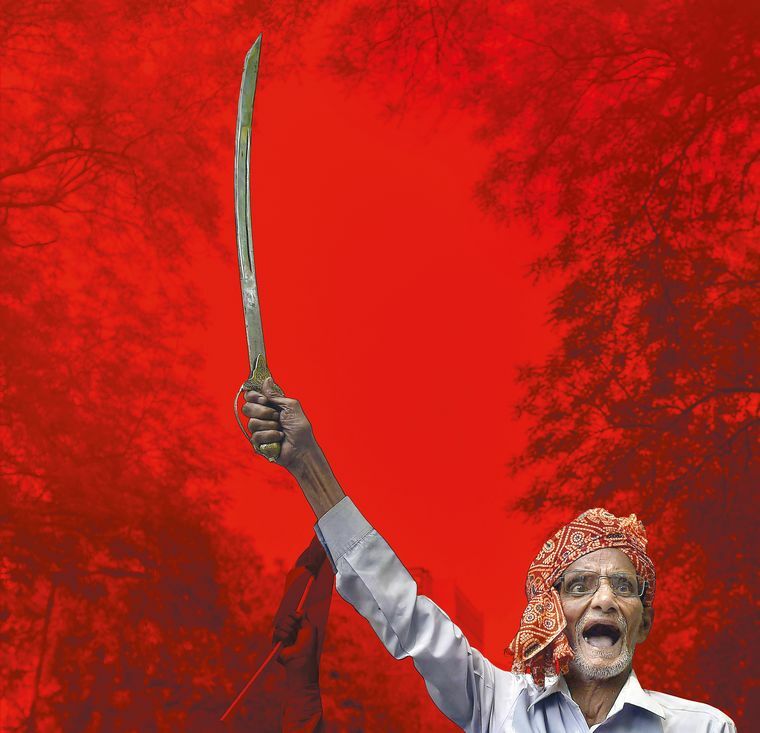 The show of strength by dalits left the ruling class stunned, even as it sent a big political message: Governments have to give dalits their due, however symbolic that due may be. The fact that the agitation had no leadership pointed to the collective anger that has long been simmering. The desecration of dalit icon B.R. Ambedkar’s statues, the continuing incidents of violence against dalits, the suicide of University of Hyderabad student Rohith Vemula, the rising demands for the abolition of caste-based reservations, and the BJP’s alleged plans to review the Constitution have all caused resentment among dalits. The spontaneity of the protests is a huge worry for the BJP. Under Prime Minister Narendra Modi, the party had been trying hard to appropriate Ambedkar’s legacy. From nominating a dalit as Indian president to building monuments to Ambedkar, Modi had been actively trying to keep the dalits on the government’s side, as they had voted in large numbers for the BJP in recent elections. But, the BJP’s dalit outreach is in jeopardy because of violent incidents in states ruled by the party. In 2016, as many as 40,801 cases of atrocities against dalits were registered across India. The BJP’s ambivalence in dealing with these incidents has angered dalits. In Vemula’s case, the party even tried to question his dalit identity. The BJP can take comfort from the fact that the recent round of protests are not overtly anti-government in nature, but are directed at the Supreme Court ruling. The big question, however, is this: Who will benefit politically from the discontent among dalits, who constitute 16.6 per cent of India’s population? In Uttar Pradesh—which sends 17 dalits to each Lok Sabha, the highest number among states—Mayawati and her Bahujan Samaj Party derive their strength from the community. The BSP had drawn a blank in the 2014 Lok Sabha elections, mainly because its leaders had joined rival parties. But, the recent bypolls in Phulpur and Gorakhpur Lok Sabha constituencies have reaffirmed Mayawati’s influence. In the run-up to the elections, Mayawati joined hands with the Samajwadi Party, which largely banks on Yadav and Muslim votes, to defeat the BJP in both the seats. In her speech, Phoole even referred to the BJP’s perceived opposition to reservation in jobs and education. “It is being said that they would review the Constitution, and end reservation. How dare they!” she exclaimed, before promising the crowd that reservation will continue to be implemented. The BJP is set to renew its dalit outreach on April 14, Ambedkar’s birth anniversary. On that day, Modi will inaugurate the Ambedkar Memorial at Alipur in Delhi, and is likely to clear the air on the BJP’s stance on matters concerning dalits. Shah has publicly raised the Ambedkarite slogan of Jai Bhim. Privately, many BJP leaders feel that it may not be enough. They want the party to rein in motormouthed leaders who have been making statements on changing the Constitution. The BJP is now set to renew its dalit outreach on April 14, Ambedkar’s birth anniversary. On that day, Modi will inaugurate the Ambedkar Memorial at Alipur in Delhi, and is likely to clear the air on the BJP’s stance on matters concerning dalits. BJP parliamentarians have been asked to commemorate the day in their constituencies as Ambedkar Nyay Diwas. “The occasion will be utilised to counter the opposition’s propaganda, and tell the public about the many welfare schemes initiated by our PM,” said Kaushal Kishore, BJP MP from Uttar Pradesh. UP Chief Minister Yogi Adityanath has issued orders to instal Ambedkar’s pictures in all government offices. In a bid to align the dalit icon with the hindutva ideology, Adityanath has decided to introduce Ambedkar’s middle name, Ramji, in all references to him in the state’s official records and correspondences. On April 14, Adityanath will be conferred the title of ‘Dalit Mitra’, or friend of dalit, by the Ambedkar Mahasabha in Lucknow. The BJP’s rivals, too, seem to be in a race to outdo each other in celebrating Ambedkar’s birth anniversary. Mayawati has asked BSP leaders to commemorate the day in all districts. Her newfound ally, the SP, has also decided to celebrate the occasion as never before. “All district heads of the party have been directed to hold grand programmes, either at district headquarters or any public place, and apprise the people of Ambedkar’s contribution in detail,” said Naresh Uttam, state president of the SP. Apparently, in a first, SP chief Akhilesh Yadav will garland Ambedkar’s statue in Lucknow as part of the celebrations. Politically, the situation is going to cost the BJP, as its hindutva agenda banks heavily on overriding caste divisions. With dalits asserting their identity, the party’s efforts to transform Hindus into a homogenous group seem to be backfiring. The impact of dalit protests will be felt in Karnataka, Rajasthan, Madhya Pradesh and Chhattisgarh—states where assembly elections are due this year. Dalits constitute 16.2 per cent of the population in Karnataka, 17.2 per cent in Rajasthan, 15.2 per cent in Madhya Pradesh, and 11.6 per cent in Chhattisgarh. Of 224 assembly constituencies in Karnataka, 36 are reserved for the scheduled castes. In all, dalits can influence the poll outcome in 60 seats. In the 2013 assembly polls, the Congress won 17 of the reserved seats, while the Janata Dal (United) won 10 seats and the BJP, seven. In the 2014 Lok Sabha elections, the Congress won three of four reserved seats. In the aftermath of the Supreme Court verdict, the BJP is already feeling the heat. Shah’s luncheon meeting with dalit leaders in Mysuru on March 31 was marred by protests. B.S. Yeddyurappa, the BJP’s chief minister candidate, had been trying to woo dalit voters by holding rallies and dining with dalit families. But, such efforts have been undermined by Union Minister Ananth Kumar Hegde’s recent comments on reviewing the Constitution. Dalit anger may be more acutely felt in Rajasthan, where Rajputs have been asserting themselves and the BJP is facing strong anti-incumbency. On April 3, a day after the dalit protests, a mob of upper-caste people burnt down houses of two dalit leaders, one an MLA and another, a former legislator. A slew of attacks on dalits have also been reported in the state in recent times. Come assembly polls, and the BJP will have a tough time trying to retain the 31 of 33 reserved seats it had won in the 2013 polls. 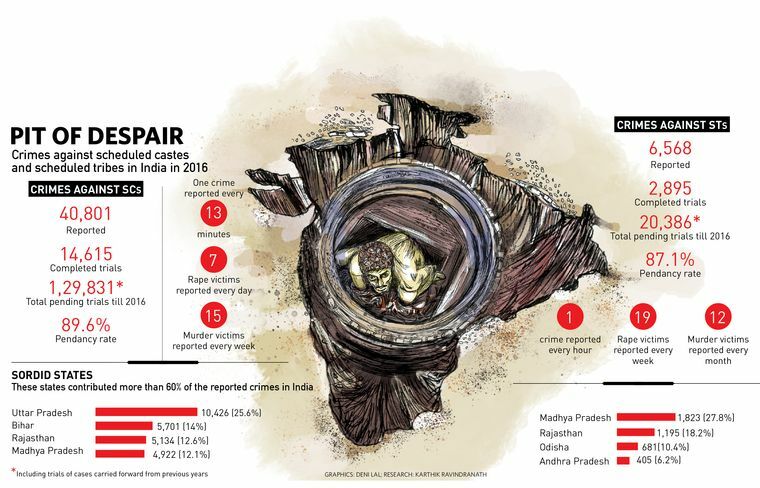 In Madhya Pradesh, which witnessed the highest number of deaths in the violence on April 2, dalits and tribals together account for about 36 per cent of the population. But, their political influence has been on the wane since 2003, when the BJP came to power and began focusing on wooing the Other Backward Classes. The Chambal and Bundelkhand regions, where dalits and tribals have considerable presence, were the worst affected by the violence during the protests. In Gwalior, where upper-caste residential areas were targeted, clashes erupted when armed members of hindutva outfits took on dalits. The prevailing situation in the state could prompt dalit voters to look for political alternatives. But, it remains to be seen whether the dalit anger would really singe the BJP. The party has mastered the complex art of winning elections, as seen in the case of Gujarat last year. The state had witnessed atrocities against dalits, and there was considerable anti-incumbency against the ruling BJP. Still, the party managed a record sixth straight victory in the assembly polls, thanks largely to a fractured opposition. The Congress fortunes were dented as dalit votes went to the BSP. The Congress, which won 77 seats against the BJP’s 99, could have easily won a dozen more seats had the dalit votes been not divided. The BJP will be hoping for a repeat of Gujarat in Chhattisgarh, where Raman Singh has been chief minister for the past 14 years. Ajit Jogi, the former Congress leader who now leads the Chhattisgarh Janata Congress, has plans to contest alone. If that happens, the BJP is likely to gain from the division of anti-government votes. It means that the dalit anger, by itself, does not spell doom for the BJP. The opposition will have to do much more to earn dividends from this discontent.